Screaming Bee LLC is pleased to release an enhanced version of MorphVOX Pro Voice Changer. The software tool provides voice morphing to online games, instant messaging, and the professional studio. The new "Adaptive Clarity" feature has extended pitch-modification capabilities and better audio quality. The Adaptive Clarity upgrade is a significant breakthrough. The new pitch algorithm can readily produce voice modifications over +/- 2 Octave range while only using minimal computer resources. As a result, the MorphVOX Pro audio quality is crystal clear and vibrant. 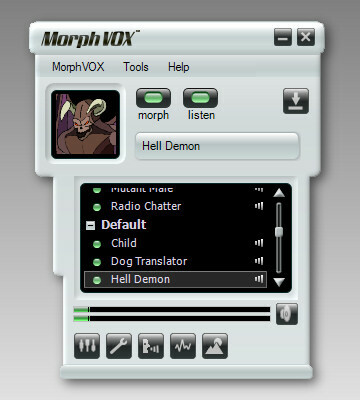 MorphVOX Pro enhances online game communication. Online gamers can now sound like the character they play, whether they choose to be an enormous giant or a grumpy dwarf. Additional voice, sound and background packs provide even more content for the program. MorphVOX Pro can be used with games like World of Warcraft, Second Life, EVE Online, EverQuest 2, Guild Wars, Counter Strike and many more. It also works well with chat programs such as Xfire, TeamSpeak, Skype, Google Talk, Yahoo Messenger, AOL Messenger, and Ventrilo. MorphVOX Pro can also morph an existing audio file or record a voice directly to file. The program's simple and intuitive interface makes it easy for users to create voice-overs. Studios that use this tool can save time and potentially thousands of dollars by creating multiple voices from existing stock audio or a single voice talent. MorphVOX Pro has been used in a number of fields, including education, radio broadcast, and animation.